Grandview Public Market has become the newest hotspot in town for young professionals, families, and friends. The place is also attracting visitors from all over South Florida, turning into a destination in itself with a balance of being refined yet approachable, upscale yet laid-back. It’s twelve noon on a work day and you’re strolling to your go-to lunch spot, looking to duck into a restaurant that’s buzzing with just the right sized crowd. But things are pretty quiet no matter where you look. Where is everyone? In case you’re out of the loop, I’ll fill you in: They’re at Grandview Public Market. One peek inside the unassuming millennial-pink door and it’s safe to say that the twelve-vendor food hall, just a few months into opening, is officially West Palm Beach’s newest hotspot for young professionals, families, and friends alike. Whether you’re in search of the perfect midday meal or hoping to wind down after a long day at work, Grandview Public Market is the place to be. 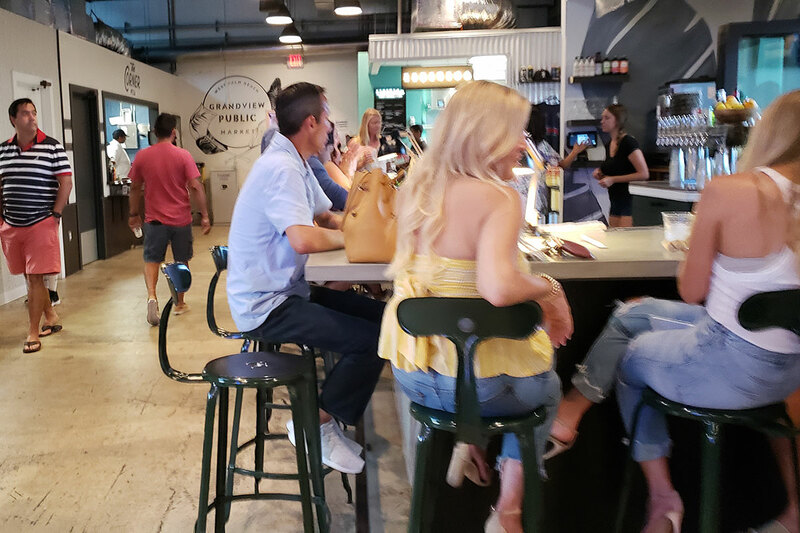 Not only is the atmosphere a comfortable, cool, and modern place to stage your next great Instagram photo, there always seems to be an innovative event planned or a fun excuse to gather way out in what used to be a no-man’s land: West Palm Beach’s warehouse district. 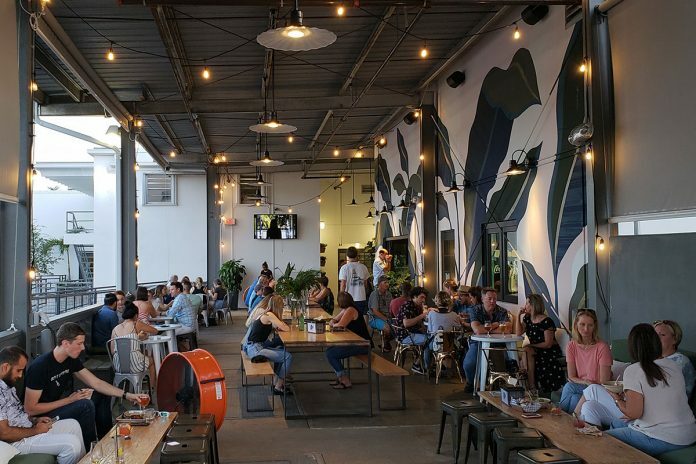 Live music enlivens the airy ex-warehouse four days out of the week, and you’ll likely come across activities like yoga classes, sing-alongs, and World Cup watch parties if you plan your trip right. The proof, as always, is in community. Become a regular at Grandview Public Market and you’ll notice the same locals who join you at the bar day after day, and yet don’t expect to always see the same faces (and those faces only). On the contrary: Grandview Public Market is a place that attracts visitors from all over South Florida. Becoming a destination in itself, the exquisitely executed concept successfully straddles the delicate balance of being refined yet approachable, upscale yet laid-back. With daily lunch specials and a happy hour from 4pm to 7pm Monday through Friday (plus a reverse happy hour beginning at 9pm when neighbor Elizabeth Avenue Station hosts special events), there’s ample opportunity to pay a visit to Grandview Public Market and have the chance to sample a varied selection of what makes the market great. Whether you opt for a craft cocktail at the Bar at Clare’s or a decadent rolled dessert from Crema, you’d be hard-pressed to find a way to leave Grandview Public Market without finding a new favorite dish you’ll crave until your return. Don’t forget about longtime favorites Celis Produce and Rabbit Coffee Roasting; these West Palm Beach staples have found a permanent home in Grandview Public Market, and their existent “cool factor” is just the right fit to throw into the mix at the market. There’s no doubt that Grandview Public Market has been a smash hit from the start, but owner Chris Vila anticipates continued improvement on the horizon. For example, soon, Clare’s will reorient its space and make room for a new vendor—though who and what remains a closely guarded secret. Happy hour aside, my curiosity about how Grandview Public Market could possibly get any better is just another factor compelling me to keep coming back. Don’t want to risk waiting in line on your lunch hour? 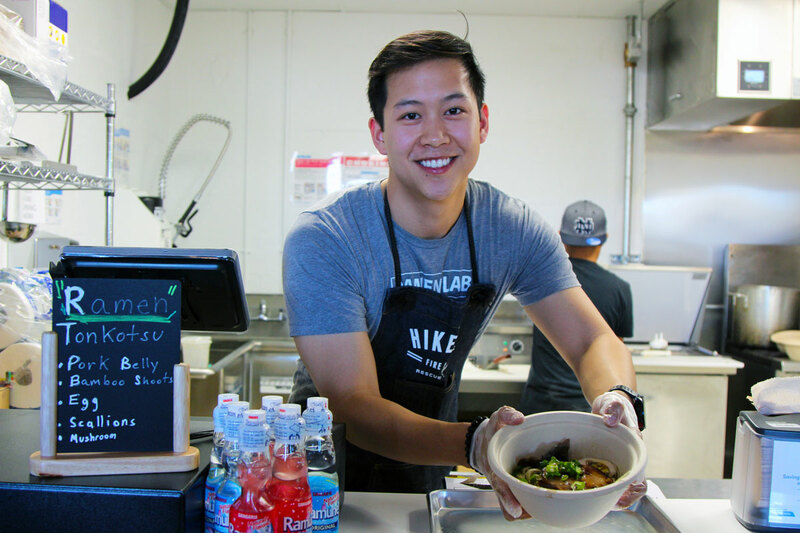 Grandview Public Market recently partnered with DoorDash, allowing you to place your order in advance and guarantee it’ll be ready for you upon your arrival. Just zip right in and then find a seat in front of the Florida-inspired mural on the loading dock. Or, bring the kids and head to Grandview Public Market on a Sunday, when you have nowhere else to be. You’ll enjoy live jazz and steel drums as the pleasant aroma of Zipitios tacos, “grandma pizzas,” and Korean chicken sandwiches helps you decide where you’ll order your meal today.